Static electricity is a well-known phenomenon. It affects many industries in diverse environments. Static charge buildup can result in potentially dangerous electrical shocks, which can cause fires, explosions and severe damage to sensitive electronic components. Static charge buildup can be caused by friction between two surfaces. This is called triboelectrification. Electrons migrate from the surface of one material to the surface of the other. Upon separation of the two surfaces, one surface loses electrons and becomes positively charged. The other surface gains electrons and becomes negatively charged. As the pressure and the speed of contact and separation increase, the amount of the static charge buildup increases. Rapidly moving materials can quickly develop charges, which produce a potential of more than 25,000 volts. In this you will separate electric charges. You will consult the triboelectric sequence to find out which object acquires a positive, and which object acquires a negative charge. You will then investigate the interaction between the charged objects. Open a Microsoft Word document to keep a log of your experimental procedures, results and discussions. This log will become your lab report. After each step write down what you have observed. Address the points highlighted in blue. Answer all questions in blue in your log. (a) Obtain a piece of sticky tape, about 15 - 20 cm in length. For ease in handling, make "handles" by folding each end of tape to form portions that are not sticky. Press the tape firmly onto a smooth, unpainted surface, for example, onto a textbook or onto the table. Then quickly peel the tape off the surface and hang it from a support. Describe the behavior of the tape as you bring objects, such as a finger or a pen, towards it. (b) Make another piece of tape as described above. Bring the second tape toward the first tape with the non-sticky sides facing each other. Describe your observations. It is important, that during this experiment you keep your hands and other objects away from the tapes. Explain why this precaution is necessary. Describe how the distance between the tapes affects the interaction between them? (c) Press two pieces of tape onto the surface and write a B (for bottom) on them. Then press another tape on top of each B tape and label it T (for top). Pull each pair of tapes off the surface as a unit. After they are off the surface, separate the T and B tapes. Hang one of the T tapes and one of the B tapes from a support. Describe the interaction between the following pairs of tape when they are brought near one another. (d) Among your belongings find a rag and a rod-like object. The rag and the rod should be made from materials near the opposite ends of the triboelectric sequence. Consult the table of triboelectric materials below. The items on top are less attractive to electrons and become positively charged when rubbed against items below, while the items on the bottom are more attractive to electrons and become negatively charged when rubbed against items above. Choose a rod and a rag, for example a PVC rod and fur. Rub the rod vigorously with the rag and then hold the rod near newly-made T and B tapes hanging from a support. Compare the interactions of the rod with the tapes to the previously observed interactions between the tapes. Describe any similarities or differences. (e) The rod and the tapes interact, because they are electrically charged. Answer the following questions based on the observations you have made thus far. How many different types of charge do there appear to be? Explain. Which tape, T or B, has a positive charge? Explain. How do two objects that are positively charged interact? Explain how you can tell. (f) In the figure below A and B represent objects with -2 and +1 unit of charge respectively. 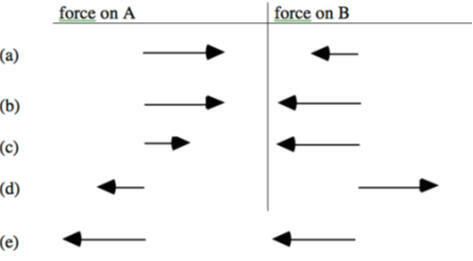 Choose the pair of force vectors that correctly compare the electric force on A (caused by B) with the electric force on B (caused by A). Why did you choose this pair? (g) The figure below shows two tapes. What kind of charge could be on tape 1 and tape 2? Do the two tapes have to hold the same amount of charge? (h) Review polarization. Imagine the following situation. Two metal balls are touching each other. A charged rod is brought near the left one. While the rod is near, the right ball is taken away. Finally the rod is taken away. At the end of this procedure, the left-hand metal ball has a negative charge. Describe what you think is happening. Why is the left ball negatively charged at the end of the procedure? Use an on-line simulation from the University of Colorado PhET group to explore the electric field produced by different distribution of charges. Create one positive charge in the middle. Take out one E-field sensor (yellow dot) and explore its behavior as you put it at various points around the positive charge. The E-field sensor measures the force per unit charge on small positive test charge. Does the E-field sensor behave as you would expect? Explain. Remove the positive charge and place a negative charge in the middle. What changes? Set up an electric dipole: a positive and negative charge separated by a small distance. Sketch electric field lines associated with this charge distribution. Where do the field lines begin and where do they end? The flux of a vector field through a surface area is the amount of whatever the field represents passing through the area. The total flux depends on strength of the field, the size of the surface area it passes through, and on how the area is oriented with respect to the field. You can think of flux as the amount of something crossing a surface. The surface is a two dimensional (real or imagined) boundary. It can be open or closed. An open surface could be a the area of a door, the area of a sheet of paper, the area of a bowl, etc. A closed surface could be the surface area of a sphere or a cube, etc. Flux is measure at a single point in time. Flux is the total amount of something crossing the surface, it is not something per unit area, etc. Field lines help us to visualize the field. The density of the field lines is proportional to the strength of the field. The number of field lines passing through a geometrical surface of given area depends on three factors. The number of field lines passing through an area A is proportional to the flux through that area. The net flux through a surface enclosing a volume can be positive or negative. It is proportional to the number of field lines leaving a volume minus the number of field entering the volume. If there is no source or sink of field lines inside the volume, than what flows in must flow out, the net flux through its surface is zero. The sources and sinks of the electric field lines are charges. If there are no charges inside a volume, then the net flux of the electric field through its surface is zero. If there is a net charge Q inside a volume, then field lines start or end there. The number of field lines starting or ending is proportional to the charge Q. We have a net outward or inward flux proportional to Q. Gauss' law tells us that the proportional constant is 1/ε0. What is the net electric flux through the surfaces S1 - S5 shown below? For each surface calculate the flux in units of nanoCouomb/ε0. The drawing is 2D, but imagine 3D boxes with flat tops and straight-up walls. Save your Word document (your name_lab4.docx), go to Canvas, Assignments, Lab 4, and submit your document.